White Wolf : Magical moment wild moose allows woman to cuddle her newborn calves. 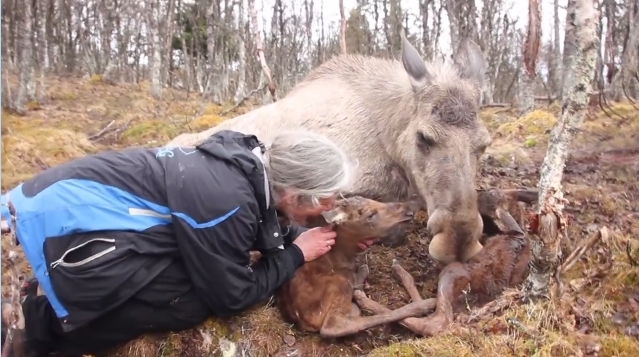 Magical moment wild moose allows woman to cuddle her newborn calves. Unique footage shows the newborn moose calves at the Long Ridge nature park in Norway. We can hear the Norwegian woman talking with the mama moose and saying: "Awww,you are so beautiful! You have such long legs, my sweet girl. The best mom in the world! You allow me to be here... you are showing such a strong trust in me .. This is such a gift." The mountain farm lies around 1.000 metres above sea level. The construction of the farm started i 1978 to realise the family Thorson's dream of a sanctuary for animals, birds and people. Langedrag lies like a fairy-tale castle in beautiful surroundings, with magnificent views of the lakes and mountains between Hallingdal and Numedal. With great respect for the natural selection throughout millions of years, Long Ridge nature park (Langedrag) has attempted to preserve wolves, lynx, reindeer, artic fox, horses, goats, Telemark cattle, Highland cattle, Yak, Mouflon sheep, fowl, duck, geese, and rabbits. Warning: Please do not try to approach a moose, normally they can be quite dangerous, especially when protecting their young. Responses to "Magical moment wild moose allows woman to cuddle her newborn calves."